Barnesville School of Arts & Sciences celebrates the unique talents and perspectives of every child. We provide an innovative educational experience that enables each student to make the most of his or her academic path in a culture of joy, support, and excellence. Our admissions process focuses on whether we are the right fit for your child to keep true to the promise of our mission to bring out the excellence in each individual. The Admissions area of our website is designed to make the application process as simple as possible using our Online Application. As a certified Maryland Green School, we ask families to apply online. It not only supports the environment, but it also simplifies submission and provides parents a tool for tracking the status of their child's admission after the application has been submitted. We are currently accepting applications for the 2019-2020 school year. Applications will continue to be accepted as space is available (varies grade-by-grade). Kindergarten - 8th grade applications were due January 15, 2019. Applications will continue to be accepted as space is available (varies grade-by-grade). March 1, 2019: priority deadline for Early Childhood (3s) and Pre-Kindergarten (4s) applications. Financial aid applications submitted after the February 15, 2019 due date will be considered only as funds remain available. You will then have the flexibility to log in and out of your account and access your open application. After submitting the application, you will be able track online your admissions status at the school by logging into your account. There you will be able to print the completed applications, monitor when the School receives supplemental application forms, and, if necessary, reprint the supplemental forms. 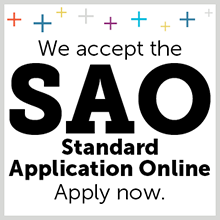 In addition to our online application, The Barnesville School of Arts & Sciences also accepts the Standard Application Online (SAO). To learn more about using the SAO and begin your application, click here. Having the prospective student spend a day on campus is an important part of our admissions process. Once an application is complete, the admissions office will schedule a time for your child to visit with his or her potential classmates. Applicants for Kindergarten through 8th Grade will spend an entire day experiencing our extraordinary teachers and welcoming community. To help each child feel immediately comfortable, an Admissions Ambassador from the same grade is selected to be a dedicated buddy for the day. Serving as an Admissions Ambassador is an honor, and our students take the responsibility very seriously. Barnesville School celebrates diversity and welcomes all applicants. We do not discriminate on the basis of race, color, religion, or national or ethnic origin in admissions and scholarship programs; nor in the administration of our educational, athletic, or other school programs.